This week i’ve been exploring Change Curves: a new model for enacting dynamic organisational change. It starts by exploring where the organisation sits on a Change Curve: resistant to change, constrained by hierarchy, or co-creative and dynamic. To move up the Curve, organisations need to frame a broad change narrative: not one hard push, but rather engagement at breadth. Providing spaces and opportunities to engage, co-create and co-own the change in a magnetic model. In this way, the organisation is drawn forward from the middle, not pushed from the top. 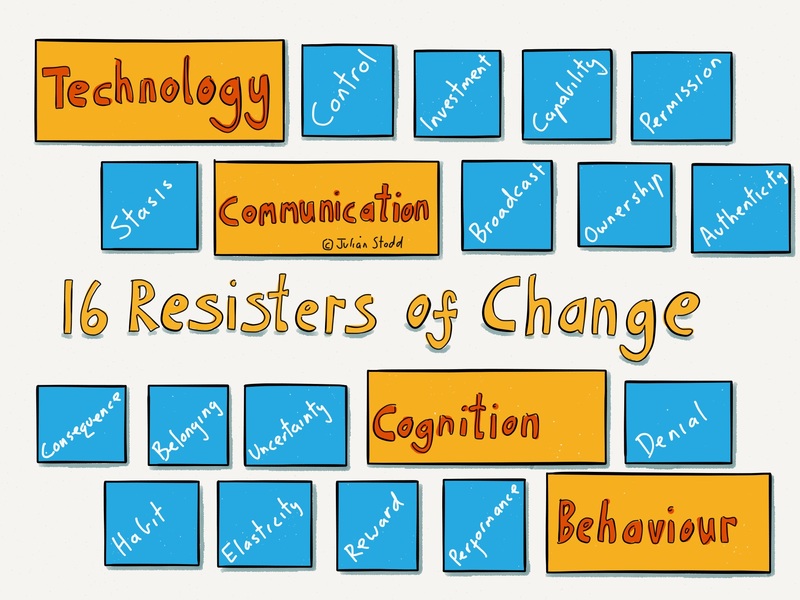 Yesterday i introduced 16 ‘Resisters of Change‘: factors that can reinforce lethargy. 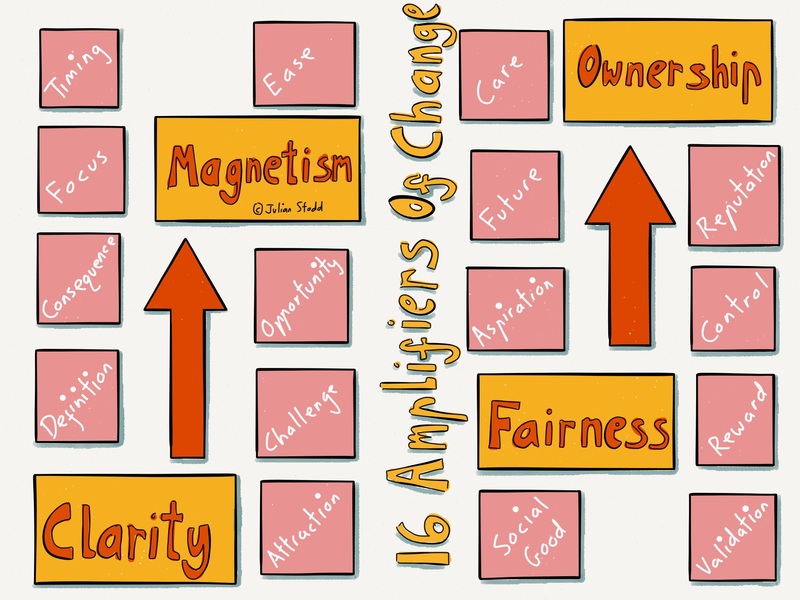 Today, it’s the counterpoint: 16 ‘Amplifiers of Change‘. The Amplifiers are grouped into four categories: Ownership, Magnetism, Fairness and Clarity, with four items in each. The intention is this: to amplify change, the organisation can link into a range of these factors, but not just rely on one. For example, they could think about how they reward engagement, how the new organisational direction creates opportunity, how people can link their aspirations with the change and how to unleash the energy of competitive individuals to support the change. These are not rocket science, but it’s valuable to choreograph where we intervene and how, to maximise the momentum. We can chart the change journey along a route from Intent to Transformation: we start with intent and build awareness. From awareness, we move to action. This is where it’s possible to get stuck, churning instead of changing. To escape the churn, we need to have momentum, which is best built through a process of co-creation and ownership. Essentially, what we are aiming for is this: that people understand the frame of change, but work together to shape and own it, investing themselves in the new reality, rather than having it imposed on them. This isn’t a naive view: sure, much organisational change is driven by efficiency, cost cutting and merger, but this is an open secret. Just because there is risk to individuals doesn’t mean that they can’t or won’t be part of the evolution. Indeed, the chance to shape it is a more fair approach: in the Social Age there is no such thing as ‘career‘ within one organisation. It’s always going to be a portfolio and involve change, so you may as well be part of shaping it. The Resisters of Change are factors that, if we don’t attend to them, will cause stagnation and reinforce the status quo. 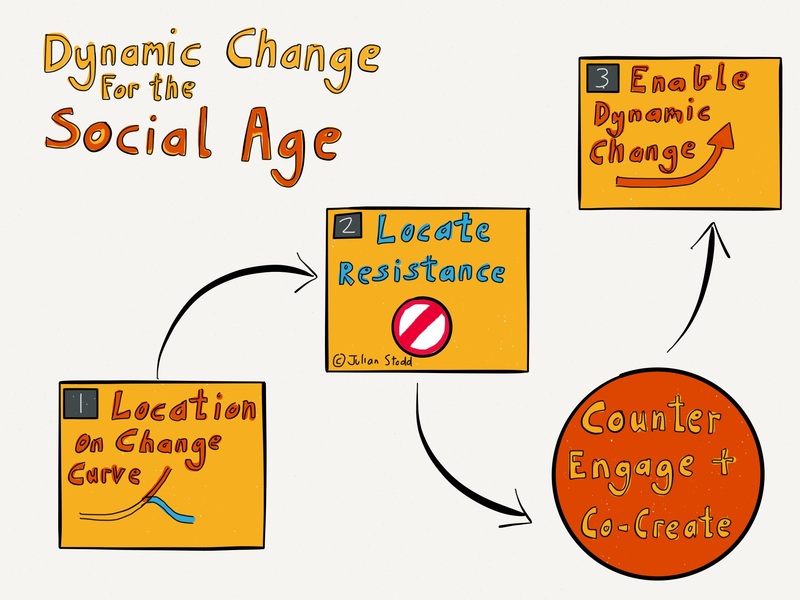 The Amplifiers of Change are factors that we can consider to help speed change up and engage people within it. Let’s consider each category in turn. 1. Will the opportunity provide space to build REPUTATION: by being part of it, shaping it and owning it, will you be associated with success and what will that look like. Remember, in the Social Age, this is not just about formal reputation, recognised in formal hierarchy and reward, but rather Social reputation, awarded by community and dependent upon action. Can you earn reputation by owning this change? 2. Are aspects of the future state under your CONTROL? This is about ownership of direction. It’s not that the community needs to own the whole of the change, but they should own part of it. Without ownership, the ground is being moved under your feet. 3. Whilst research shows the financial REWARD is not necessarily the highest thing on people’s agenda, we do nonetheless need to consider Reward: how are people rewarded for co-creation change, be it through reputation, recognition or something else entirely. 4. Finally, consider VALIDATION, of your ideas or values. People are neither passive nor stupid: if we are able to tie into their energy and expertise, our work will be stronger, and by doing so it may give them some validation. The fact that people recognise the value of your thinking can be rewarding in itself. Whilst change can often result in downsizing or reshuffling, it does not, in itself, need to be inherently unfair. We can consider FAIRNESS in an active context: by being fair (which is in any event a responsibility of Social Leaders), we can amplify change. 1. A socially responsible business will consider the SOCIAL GOOD of any action: by understanding how change will impact on the wider community and world, we can work out our place within it. If that change is good: people are more likely to engage. 2. Consider the ASPIRATION of the individual: the person they want to be. If change creates spaces and opportunities to move towards the aspired self, it may be engaging. 3. Whilst the pressures of the Social Age can drive us to short term vision, as individuals, we have a long term view of our FUTURE: is the long term win just for the organisation, or for me to, maybe through reputation or other factors. By bringing a future view into the conversation, we can move beyond short term ‘scared‘ conversation. 4. A coherent community includes a range of behavioural types, including nurturing behaviours: will change allow me to CARE for others? Who is affected by the change, who cares? 1. What is the EASE of engagement in change? Do we throw up barriers, or create clearly signposted spaces to engage. Making it easy will drive up engagement. See also work on ‘choreography‘ in relation to how we choreograph this engagement to be easy. 2. Following on from this, is the OPPORTUNITY clear: often we focus on trying to soften the blow of the hard impacts, but at the cost of sharing the opportunity. Where change is constant in the Social Age, so too are the opportunities that it presents: by surfing on change instead of fighting through it, the agile individual and organisation can thrive. 3. Some people will relish escaping the routine of the everyday, so will engage with CHALLENGE. Don’t try to soften the demands: make them challenging and create spaces and permissions for individuals and communities to rise to them. 4. Finally, what is the ATTRACTION of the future state: how good is the change and can i clearly see my place within it? If i can, if it’s clear, i can decide if i want it. 1. How good is the DEFINITION of the future state and process to get there: is there a clearly signposted route and can i see myself in it. 2. Change brings risk: is there a shared view of CONSEQUENCE around failure as we change and learn? 3. What capacity is there for people to find their own FOCUS: is there a part of the whole that i can engage with? 4. Finally, is there clarity about TIMING of what is expected, when, by whom? As with the Resisters to Change, we don’t have to tackle all of these at once, but we need clarity around them: our route to change, in the second part of the change process, is to build a narrative track through these Resistors and Amplifiers. Broad engagement will provide the best opportunities to generate engagement and co-create a model of change. This entry was posted in Change and tagged Amplification, Amplifiers, Change, Change Management, change process, Clarity, Creativity, Fairness, Magnetism, Organisational Change, Ownership, Social Age. Bookmark the permalink.